Moo0 Font Viewer lets you see and test all your installed fonts at once, with any sample text of your choice. Have you ever wondered which font to use for your design? Then, this may be the tool you've been looking for. - Bug fix in releasing some conponents' focuses. - Further bug fixes in the list box scrollability. - Bug fix in which the list items weren't scrollable by mouse-wheel when the font size was very large. Swedish support was made possible by Göran Malmberg, Idre, Sweden. Thanks really a lot!! - Improved some behaviors to be more user-friendly. 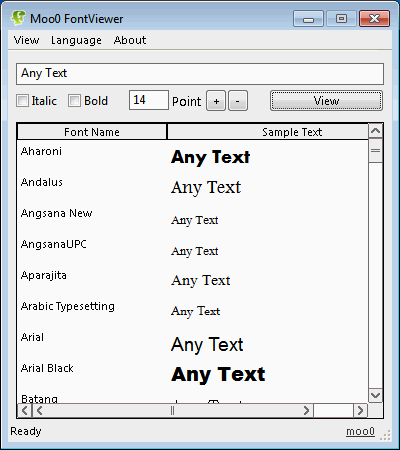 - Its English name has changed from "Moo0 FontViewer" to "Moo0 Font Viewer".